Stitches and Scissors: My Weekender! I have been wanting to make Amy Butler's Weekender travel bag for a long time now and finally got up the courage. Everyone said how awful it was to make and what a pain it was to sew it so I was SOOO nervous. I am here to say that it was way easier then everyone made me to think. It does take a long time especially with all the cutting you have to do but it is worth it! 1. 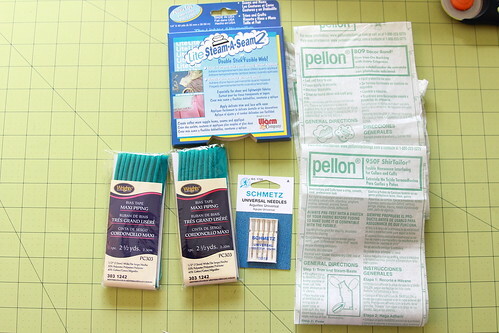 I bought pre-made cording/piping. The pre-made is from JoAnn's and is smaller then the pattern tells you to make the cording but I didn't care it eliminated me having to make it. 2. I used Decor Bond which is fusible instead of Peltex. Everyone said how hard it was to sew with the Peltex so I thought getting something that was not as thick would make my experience better. I used 2 layers of Decor Bond. Decor Bond is 40" wide so you can buy the same amount as the pattern says to buy for Peltex (which is only 20" wide). 3. I bought ShirTailor fusible Nonwoven Interfacing since I couldn't find what the pattern asked for and it worked awesome. 4. I used an 18 needle since I would be sewing with thick layers. 5. Fusible Tape! It made sewing the cording really easy. 7. 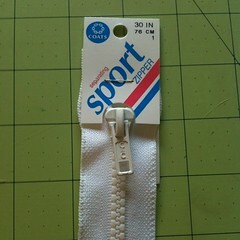 I bought a 30" zipper that is separating. I knew that I could hand sew the end of the zipper to keep it from separating and also with the zig zag stitch the pattern tells you to do on each end of the zipper the zipper would not separate. 8. I did not hand sew the lining inside. After the bag was all done I pinned the lining along the zipper on the inside of the bag and sewed it on along the zipper seam on the right side of the zipper (the top of the bag) so that stitching you wouldn't see since it was on the already stitched line you made when you sewed the zipper onto the bag. Hopefully that makes since here is a picture. 9. I cut 2 extra halves of the main panel out of the lining fabric and added in the shirtailer interfacing to make 2 pockets in the lining. I then sewed the pockets onto the main panel lining. 10. I added a zipper pocket to the main front pocket. I cut out an extra pocket lining and sewed an 16" zipper to the lining and the main fabric so that I have 2 pockets in one! This makes it so you don't have to do cording on this pocket. 11. I reinforced the handles on with an X pattern to help the handles be stronger. 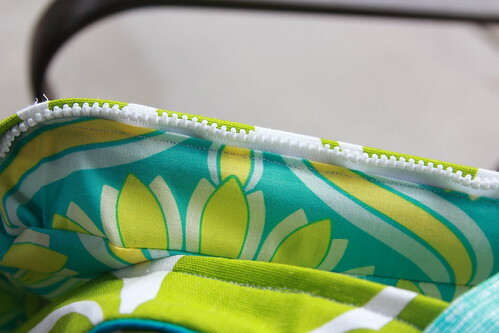 My interior lining is actually really nice looking with machine sewing the lining on the zipper. I was pleasantly surprised! Needless to say have fun and make the bag your own. It really isn't that hard to make! I promise. Even with the Decor Bond it stands on its own and has lots of strength. 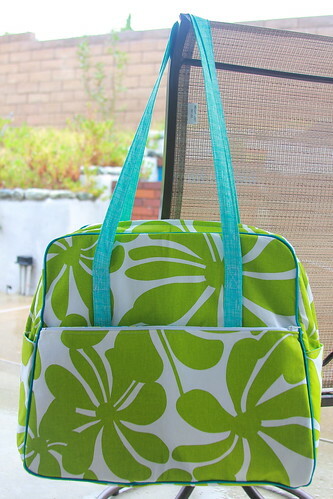 Well I am ready now for The Sewing Summit and I will be having tons of fun traveling with my handmade Weekender!!! Good for you - it DOES look awesome! it turned out perfect - a big project indeed. Absolutely beautiful. I love your bright fabric choices. Very, very nicely done. Congratulations! It's beautiful and I love the changes that you made! Stunning!! I love the changes you made - you're going to be the envy of the summit! Have a blast at Sewing Summit! I've done a few AB bags, and I think I'm getting more confident about winging it on certain changes but sheesh, does there have to be SO MUCH CUTTING?! Amazing!!! And of course I love your fabric choices! wow wow! It turned out AWESOME! The bag looks great, thanks for sharing your process and changes with us. I'm so jealous of those that are going to The Sewing Summit; but hope to go next year. Wow. It turned out so well! I've been hesitant to start it, too, but I just might try it over Christmas break! This is gorgeous! The best I've seen! Yep, you rocked this! 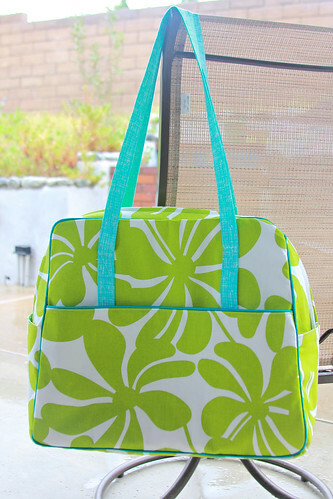 It's a great bag, and I'm so impressed you whipped it up so quickly! Love it! I love the additional pockets you added, very helpful in such a huge bag. And I agree with you, it wasn't as hard as everyone made it out to be. Though, it was a difficult bag! Thanks for all the details. 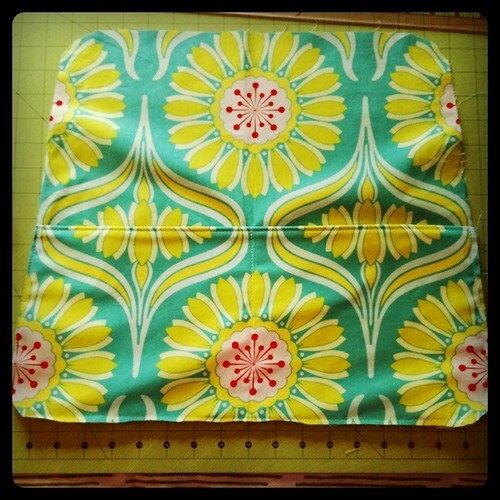 I have had this pattern and even have the fabric all cut for several years now, but, like you, had heard it was going to be horrible and haven't had the courage yet. Maybe you'll push me over the edge to do it now. It is beautiful. The pattern is hard, but only because of the thick layers. I sewed it using the original instructions where you are sewing through fabric and layers of peltex. It was fun! I actually found this to be much easier than her diaper bags in her Little Stitches book. It is definitely worth it to make this bag, though! I want one:) it is flippin awesome Dars! Great job! 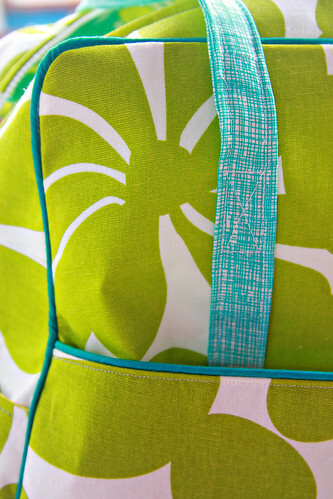 I love the fabric you've chosen for the bag, too! I've had all of the supplies and pattern for this bag for over a year, but have been to nervous to make it (so much $ spent on the supplies!) ... thanks for inspiring me to actually sit down and make it! Very nice, and I like the way you've customized the pattern! I have peltex and have never used it, all I could see was needles snapping! Great suggestion to use two layers of Decor Bond! I also tend to reinforce straps and add pockets/zippers to patterns I've been doing! Never enough,right? 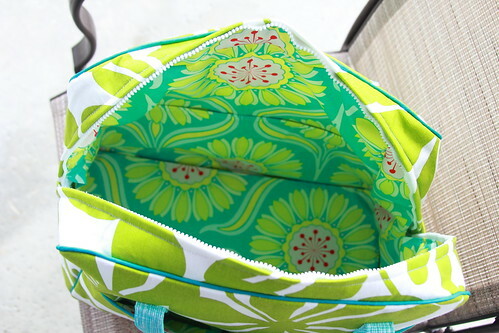 Thank you for sharing your completed Weekender! 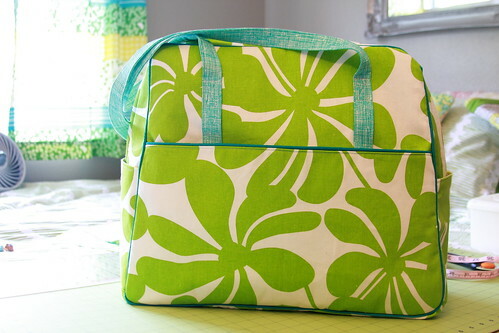 I have another Amy Butler large bag pattern...definitely should attack it soon! I love your post ! Now I will start aswell :-) I have had this pattern for ages.. Thanks ! great looking bag, and I love the fabric! I love your changes - so clever! Love!!! But not quite as much as my new pillow in my living room :) thanks so much!!! Wow - I want one! Will you sell those on your etsy too? I have had this pattern but have not made it because I have not found any fabric I like. I love the fabric you have chosen! Who makes it and or where did you get it? Terrific job! Thanks so much for the awesome tutorial! Where can I find the actual patterns to use.com couldn't find it. Awesome tips. I am going to make one to take with me this year to sewing summit...well, I actually had to sell my ticket but Ill still be there (even staying at the hotel!) for a wedding. Long story. Are you still happy with the interfacing you used? And do you think you can use regular fabric or do you have to use home dec? I love it! Definitely going to attempt to make one of thaw. Thank you for sharing. I had this pattern in my stash for almost a year but it looks so overwhelming I haven't attempted it. 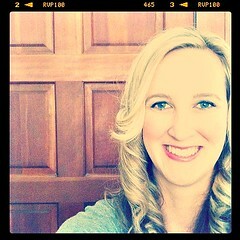 Thanks for posting this, you've given me a little more confidence & I am pinning this to note your product changes! 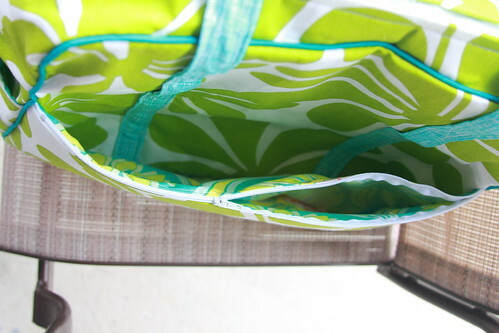 Thankyou for this blog post - i wanted to make a bag with the longer handles and ive made it before in A Level and the length just wasnt right - i will use your length calculations and give you credit!